Too much sugar not only contributes to obesity, but also is a culprit in diabetes, high blood pressure, and stroke. Researchers say that eating a lot of sugar may increase a person's risk for heart disease. They say that people who eat more added sugar are more likely to have higher triglycerides and lower levels of protective high-density lipoprotein or HDL cholesterol. An influx of sugar into the bloodstream upsets the body's blood sugar balance, triggering the release of insulin, which is used by the body to keep the blood sugar at a constant and safe level. Insulin also promotes the storage of fat, so when your sugar intake is high, you're making way for rapid weight gain and elevated triglyceride levels, both of which have been linked to cardiovascular disease. Complex carbohydrates tend to be absorbed more slowly, lessening the impact on blood sugar levels. Refined sugars lack minerals and vitamins, so they draw upon the body's micro-nutrient stores in order to be metabolized into the system. When these storehouses are depleted, metabolization of cholesterol and fatty acid is impeded, contributing to higher triglycerides, cholesterol, and promoting obesity due to higher fatty acid storage. For long-term health it would be important for you to start looking at how much added sugar you're getting and finding ways to reduce that. Lowering blood sugar levels could reduce the risk of coronary heart disease in both diabetics and non-diabetics, according to researchers at health institutions. 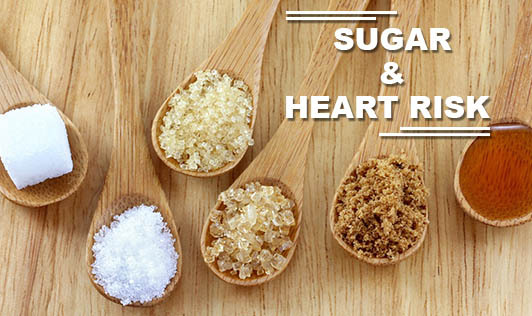 The recommended sugar intake for a healthy individual per day is 4-5 tsp [20-25gms].